Making Ballybunion your base for your golfing Holiday makes great since. With so many Great Golf courses so close to Ballybunion its the ideal Base Camp. 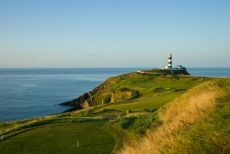 Dooks Golf Club, Killarney Golf Club, Waterville Golf Links, Killarney Golf Club, and of course the Old Head of Kinsale. Tee times arrange for confirmed Guests at no extra cost. Just click on the Golf Course listed below for full details of information. For all bookings / reservations and Inquiries call 0866000665 or fill in the inquiry form listed below.